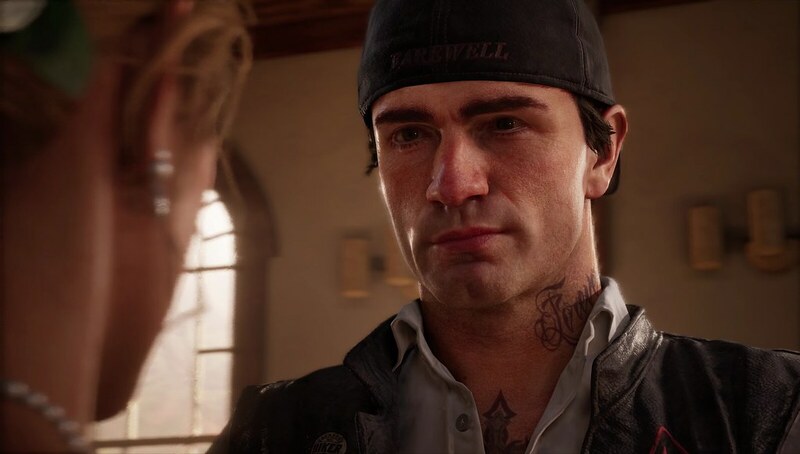 In a Days Gone storyline called “I Remember,” Deacon attempts to deal with his tragic past. Long before a global pandemic killed the world — turning the Pacific Northwest into a terrifying no-man’s land of Freakers, Marauders and those just struggling to survive — the Farewell Wilderness set the stage for an unlikely romance between an outlaw biker and an extraordinary young woman from Seattle. The wilderness is where they met, it’s where he taught her to ride, where she taught him about botany — the reason she was in the high desert in the first place. It’s where he proposed to her. It’s where, in a small church in the tiny town of Marion Forks, witnessed only by long-time friend William “Boozer” Gray, Deacon and Sarah were married. With just a touch, Sarah Whitaker’s charm and sincerity was always able to soften Deacon, allowing him to show his awkward and tender side. He loved her so much that, a longtime member of the Mongrels MC, Deacon St. John chose to leave the MC and become a NOMAD for her so they could spend more time together. Share a life together. Two years later, Sarah is gone. Deacon, now a drifter and bounty hunter on the broken road, is left with only a photo to remind him of the woman he loved and the man she had helped him become. In a brief moment of peace at the church where they exchanged vows, Deacon reflects on everything he’s lost, the burnt out shell of the church, a reflection of the man he’s become — haggard, worn, and alone.